Martin Hanson Kofod was born on April 18, 1829 in Copenhagen Denmark to parents Nils Johnson Kofod and Grete Marsha Kofod. We know little of his early life or when he immigrated to the United States. 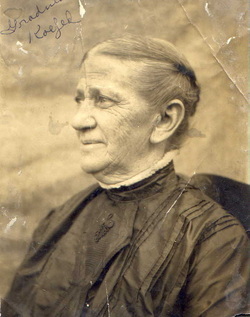 Johanne Marie Johnson (known as Mary) was born on November 16 1833 in Kragerø, Telemark, Norway to Johan Albrecht Johnson and Maren Katrine Zakariasen. We know little of her life in Norway. From an newspaper article in the Door County Advocate in 1930 we know that she left Norway in 1849 at the age of 15. The voyage took 8 weeks and as food ran low they lived on potato skins. At this time famine and difficulties with Swedish regulations on fishing encouraged Norwegian immigration. 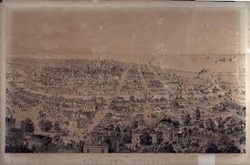 The family arrived in New York on July 31 1849 on the boat Favorite. Mary arrived with her parents, and five siblings. They settled in Milwaukee Wisconsin where both parent passed away. 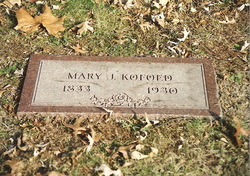 Johanna was married to Martin Kofod on December 2, 1852. The records are very complete and give us the names of both parents (One additional generation in both families). The record is from microfilm of records at the Milwaukee county courthouse. It might be noted that through the years Kofoed was spelled a number of different ways, I will use the spelling in the record I am referring to. The 1860 Census finds Martin and Mary living in New Berlin, Waukesha County (Listed as Martin Koufet). 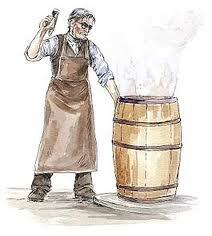 Martin is listed as a cooper, a barrel marker, and the value of his personal property is $100.00. New Berlin was a rural town west of Milwaukee at this time. Daughter Laurine was born in 1860 followed by Martin in 1863, John in 1866, Irina (Trina) born in 1869, and Johanna Marie in 1873. In 1863 we find Martin Kofod 39 years of age listed in the US Civil War Registration list for the first Congressional District which included the city of Milwaukee. He is listed at this time as a butcher. Though he was registered he did not fight in the Civil War. 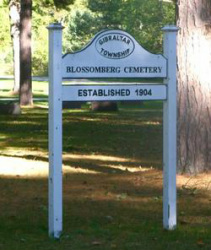 At some point during this decade the family moved to Door County Wisconsin and located at Blossomburg near Fishcreek. The 1930 article states that Mary had seven children of which we have records of five. The 1870 Census finds Martin and Mary living in the Fish Creek area of Door County Wisconsin. Martin is 45 and listed as a cooper born in Denmark. It does note that he cannot read or write and that he is a legal citizen of the United States. It does not have a value for his real estate or personal property. His children as listed as Lorina, Albert, John and Margaret. The 1880 census finds Martin and Mary (Listed as Johanna) living in the same place in Door county. The enumerations list is for the town of Gibraltar. The unincorporated community of Fish Creek is located in the Town of Gibraltar. Martin is listed as 56, a cooper and has been employed for all 12 months of the year. It says that he was born in Denmark. Martin became a successful butcher in Blossomburg Wisconsin establishing a good reputation and a business that reach out to many of the surrounding town. We know from articles in the Door County Advocate over the years that he built an early refrigerator and kept stores of beef, venison and mutton as well as fish. 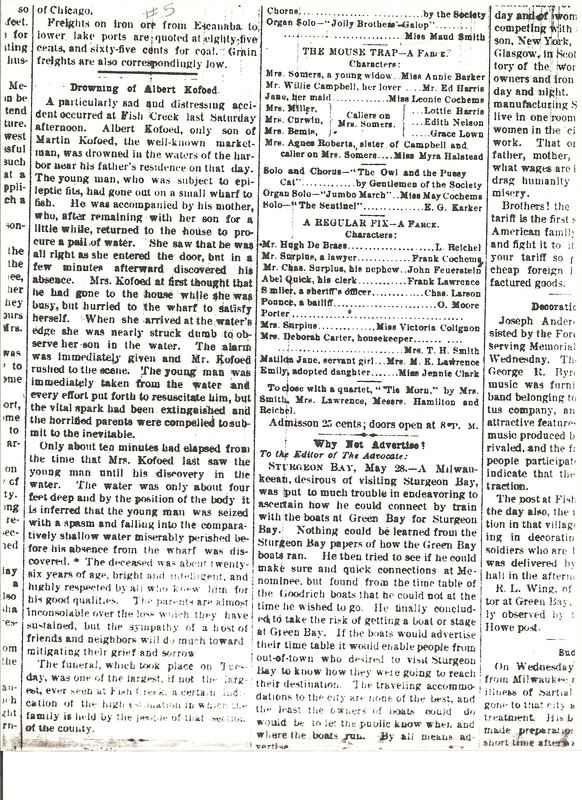 May of 1888 reported the drowning of son Albert. It stated that he was subjected to epileptic fits and that he fell off the pier during one and was drowned in less than four feet of water. The article also states that his mother was with him on the pier and that he seemed to be alright. She left to return to the house for a pail of water. As she entered the house she saw him on the pier. When she came out he had disappeared and she ran to the pier to see him lying under the water. Martin dies May 26th 1890. An article in the Door County Independent on Friday May 30 1890 stated that he died on Monday and that his daughter Mamie found him sitting in a chair. She ran to a neighbor’s C. Lundberg and upon investigation, it was found that he was dead. It was the anniversary of his son’s death two year earlier. Martin was buried in Blossomburg Cemetery in Door County, Wisconsin. The cemetery is currently part of the Peninsula State park. A search in the 1980's found not stone for Martin, however the following Kofoed gravestones were found. After Martin's death in 1892, Martin and Mary's daughter Johanna married Ferdinand Charles Bretsnyder in 1896. At some point Mary moved in with her daughter's family. The 1900 census finds Mary in Chicago, ward five on 22nd Place. She is in the household of her son in law, Ferdinand Bretsnyder. Mary's age is listed as 66, is a widowed and notes she was married for 37 years. Mary lived many years passing away at the age of 96 on April 4th 1930. Burial was in Oak Grove Cemetery in St. Louis Missouri located at 7800 Saint Charles Rock Road Normandy, MO 63133.